Total domestic direct investment (DDI) realization in 2018 reached IDR 328.6 trillion, showing a solid increase of 25.3 percent on an annual basis. Meanwhile, total foreign direct investment (FDI) realization in 2018 was recorded at IDR 392.7 trillion, down 8.8 percent (y/y). Industries that cause the loss of rainforest and peatlands in Southeast Asia were bankrolled to the tune of $62 billion between 2013 and 2018, according to new data released by the Forests and Finance campaign of the Rainforest Action Network (RAN). Bloomberg reported that Indonesia wants to re-position its Batam island as an alternative shipping and manufacturing hub to Singapore with a potential to draw USD 60 billion in new investment. “Xinjiang, what a wonderful place,” declared an op-ed by China’s ambassador to Indonesia, Xiao Qian, published by the Jakarta Post last September. Rescuers were ready to rescue villagers near Mount Karangetan volcano in Indonesia’s North Sulawesi province through sea if the volcano spewed more hot lava, a senior official said on Tuesday (Feb 5). Philippine Interior and Local Government Secretary Eduardo Ano said on Tuesday that Indonesia has expressed willingness to help Philippine authorities identify the Indonesian “suicide bombers” that carried out the twin blasts on Jan. 27 which left 23 people dead and more than 100 others wounded. Indonesia’s presidential candidates neglected to discuss violations of people’s freedom of religion during their first debate in January, but this came as scant surprise to Yendra Budiana, an Ahmadi. One of the most significant problems in Indonesia’s economy is the current account deficit, meaning the country imports more than it exports. A circle of violence remains unstoppable in the Indonesian province of Papua. Last weekend, a civilian was again gunned down by the armed Papuan rebels in a village of Jaya Wijaya District. On the face of it, Indonesian President Joko Widodo’s flip-flop over whether to release the jailed jihadi preacher who inspired the Bali bombers should be of little concern to foreign investors. Indonesia and Switzerland have signed an agreement on mutual legal assistance (MLA) after two rounds of negotiation in Bali and Bern, the Indonesian Embassy in Bern, noted in a statement on Tuesday. The United States and China are racing against time to resolve their trade dispute before the March 2 deadline. Airlangga Hartarto, chairman of the Golkar Party, has clarified that incumbent presidential candidate Joko Widodo (Jokowi) did not accuse Russia of meddling in the Indonesian presidential election. President Joko ‘Jokowi’ Widodo signed a Presidential Regulation on the Supply and Distribution of Natural Gas through the Natural Gas Network for Small Households and Customers. Indonesia is optimistic that it will be able to attract more investment this year despite the implementation of simultaneous legislative and presidential elections to be held on April 17, 2019. The Public Works and Public Housing Ministry has built a total of 949 retention basins over the last four years. 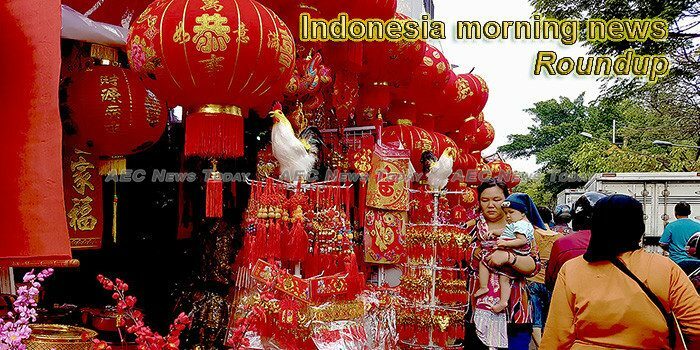 Hundreds of Indonesians of Chinese descent in Bandung, West Java, were forced to abandon a ceremony to celebrate Chinese New Year on Tuesday morning as a fire destroyed Samudra Bhakti temple. State-owned mining holding company PT Indonesia Asahan Aluminium (Inalum) recently established the Mining and Minerals Industry Institute (MMII), a research center aimed at boosting the downstream industry to help meet the government’s goal of reducing imports. Intellasia East Asia News Indonesia’s Ministry of Industry continues to strengthen its strategies to meet the needs of Industry 4.0, according to a recent press release. The Jakarta administration plans to transform the Tanah Abang area in Central Jakarta into an upscale business district similar to SCBD in South Jakarta, an official has said. Five domestic helpers have recently been deported back to Indonesia for being supporters of armed violence, one of whom had worked for an employer who reported her to the authorities. A whirlwind damaged 52 homes and a mosque in Pamekasan, Madura Island, East Java Province, on Monday. A sea toll road program has managed to reduce the price disparity of basic commodities in the eastern part of Indonesia, Minister of Trade Enggartiasto Lukita said. Intellasia East Asia News There were no talks on how to combat terrorism during the first presidential debate on January 17, contradictory to the viewers’ expectations that the candidates would tackle counterterrorism policy.